Have I ever told you how much I love the summer’s bounty of fresh greens? Between my CSA and my local farmer’s market, I am able to get some amazing fresh and local goodies. It really pushes me to do more with what I have on hand. It also prevents me from reaching for easy and quick processed foods. I love finding new ways to cook with fresh ingredients. I’ve been having some great results. My mom taught me about frittatas on a visit when I first became a mother. 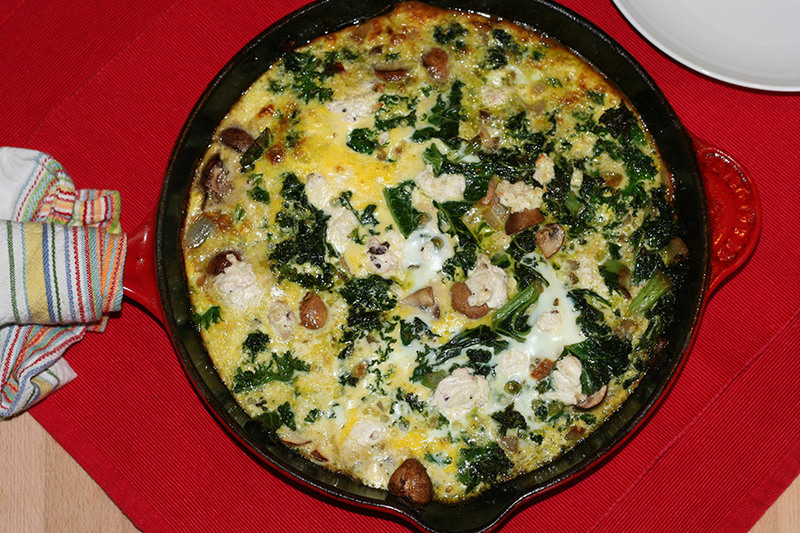 She showed me how a frittata could be the answer to a fast and easy dinner. It comes together quickly and it’s a pretty forgiving dish – allowing you flexibility with ingredients. 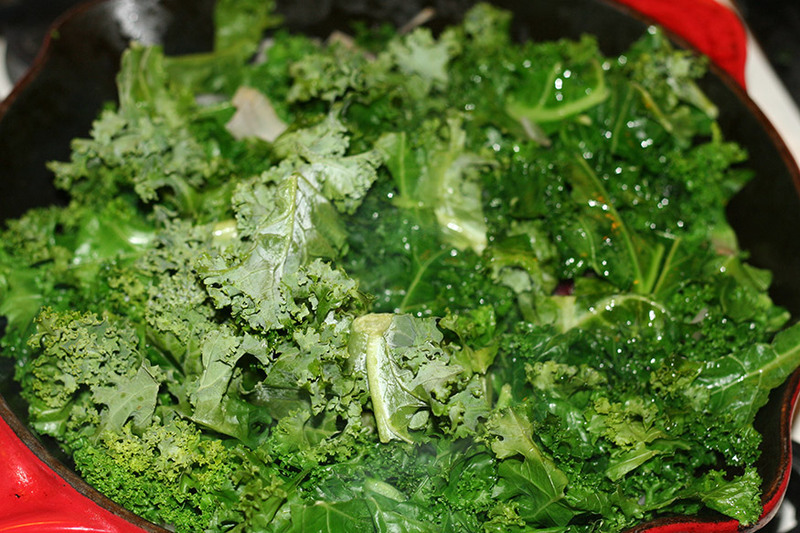 I picked up some amazingly fresh kale at the market and I knew I wanted it to be used for a main dish. I didn’t want it relegated for a simple roasted side dish. I settled on this frittata which did not disappoint. I chopped up some shallots and garlic and sautéed in olive oil along with some salt, red pepper flakes and fresh ground pepper. 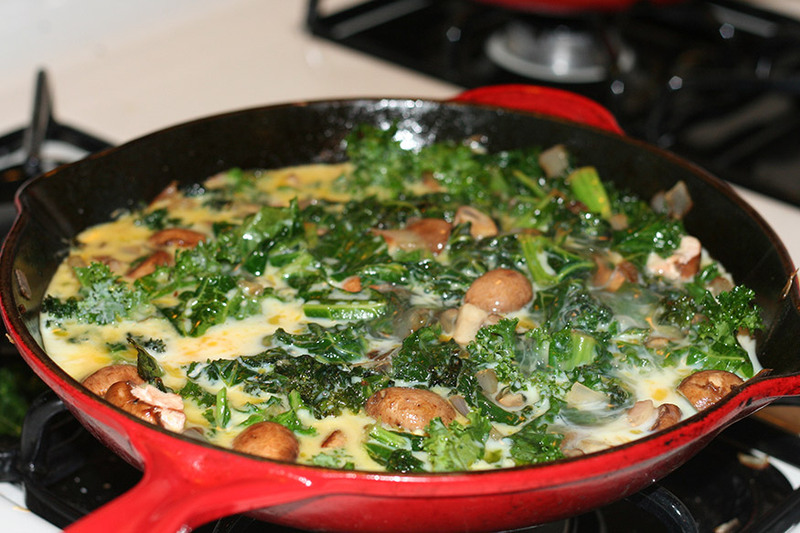 I then added some kale and cooked for another few minutes. 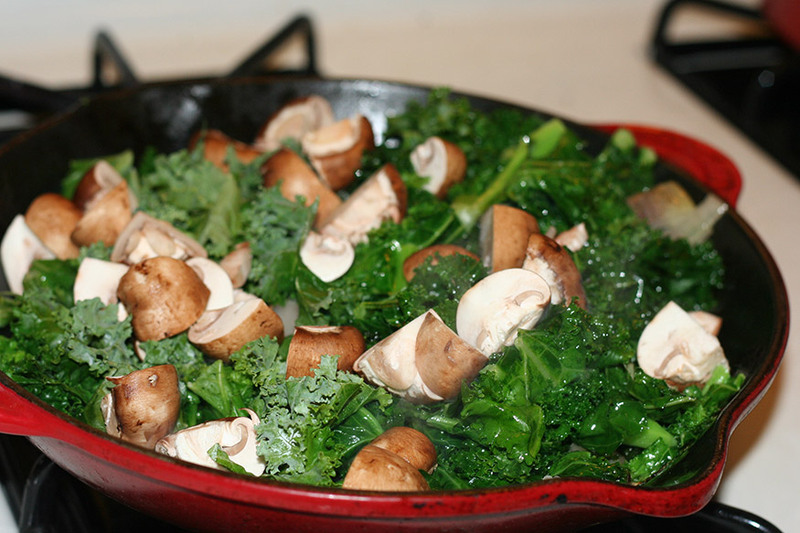 Next, I added some cut up baby bella mushrooms to the pan and sauteed a few more minutes. I didn’t want to cook the greens and mushrooms too much. I wanted there to be some bite in the finished dish. I beat some eggs with some milk, salt and pepper in a small bowl and then added it to the pan. I let the eggs set a little bit and then added spoons of goat cheese around the pan. I then transferred the pan to the oven and broiled for a few minutes until set. I served the frittata with a simple green salad. Delicious! This is perfect for any meal of the day! Add in the chopped kale and cook for a few minutes. Add in the mushrooms and cook another 2 minutes. Mix up the eggs with the milk in a small bowl. Add in the spices. Pour the egg mixture in to the kale mixture and let set a bit. Spoon in the goat cheese around the frittata. Transfer the pan to the oven and broil for about 4-5 minutes, until completely set and the edges have browned a bit. Slice in to wedges and serve. Enjoy! we done this with feta and it’s also good. there are very few cheeses I don’t love. looks delish! 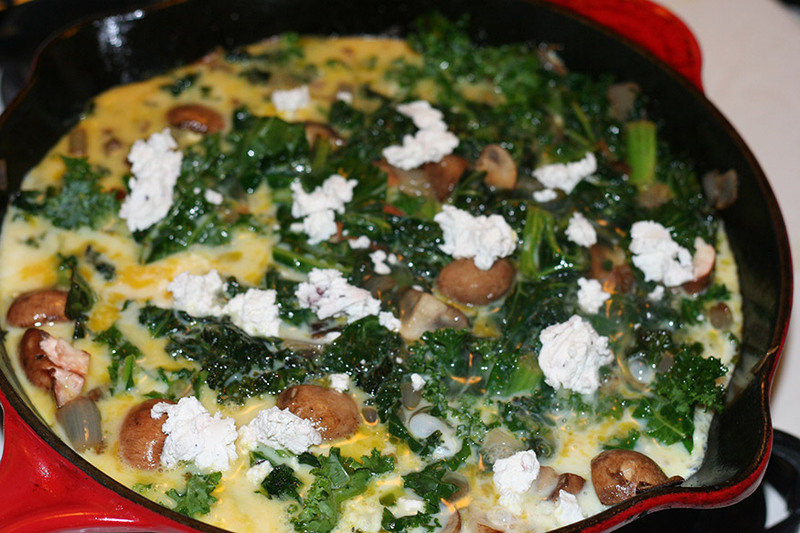 I so love frittatas and LOVE kale – very inspiring! This looks fabulous! I love making frittatas, this one looks yummy. Also loving your site makeover! 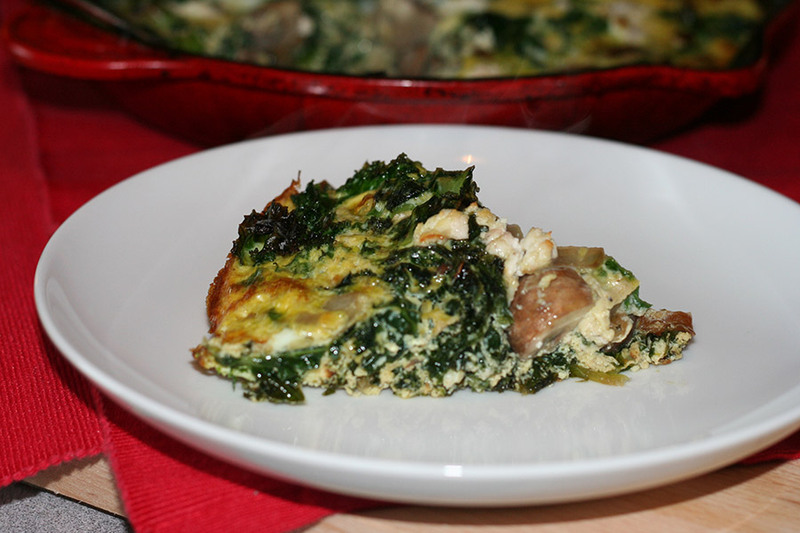 Frittatas are amazing and so great for the 9 days! making my 9 days menu now, so this recipe will definitely come in handy! I love how healthy this is – packed full of greens. You make me want to sign up for a CSA. Thanks! I really love getting fresh local fruits and veggies. Totally worth it! There are so many in Brooklyn. I am sure there is one near you! This looks so great! I like to make fritattas for breakfast on shabbat and this version looks like one I will have to try soon.